As someone who spends a lot of time at the gym, it will come as no surprise that I have been on the hunt for some protein-based products to fuel my body both pre and post-workout. For those who work out regularly, protein is important in your diet as it is essential for muscle growth and repair. 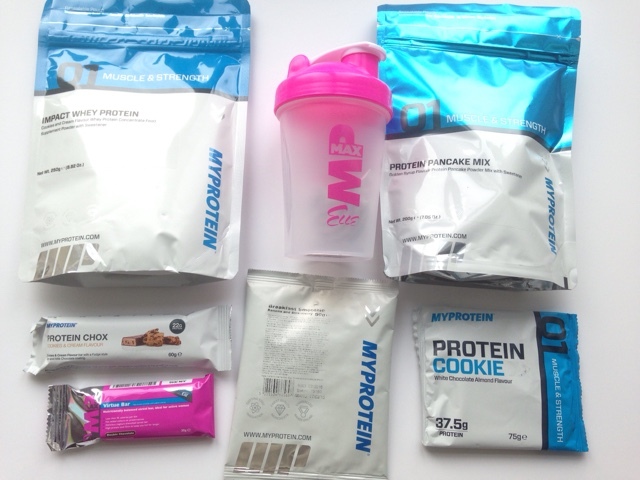 Myprotein recently got in touch with me to see if I would like to try out some of their products. Strangely enough, this brand was actually one that I had heard good things about and was leaning towards to ordering some products for myself. This stuff is like a magic pouch of goodness. It tastes exactly like an Oreo milkshake which is one of my favourite flavours. I have enjoyed using it and I am really looking forward to ordering more of this flavour as well as some of their other flavours. When I was little, my Granny made amazing pancakes on her aga and since then I have been addicted. Needless to say, I was very happy when these were sent for review. These taste really good and the first time I tried them, I actually couldn't wait to cook a stack so ate them as they were ready. If you have a bit of a sweet tooth like myself, then you will love this product. It's a chocolate bar without being a chocolate bar if that makes sense. It has all the taste of a chocolate bar but without all the naughtiness that a chocolate bar brings. I loved this bar that it disappeared far too quickly for my liking...oops!. If I could compare it to anything then it would actually be a Chocolate Crispy cake. If you want to start somewhere, then I would definitely recommend trying a sample of this. I have already added it to my order list. I used to have smoothies all the time until I got sick of cleaning my blender. However, this product is a smoothie in a packet which means, for me, no blender mess. Initially, I really liked this product but I did find the more I drank, the more the product became too sweet for my taste. Although saying that, I probably would try this one again. I'm reluctant to say this but I was not a fan of this product. I wanted to like it as I like cookies and white chocolate but this was not for me. I think the main reason is due to the marzipan-y taste as I do not like anything that tastes like marzipan whatever food it is. Shame really. Overall, I liked the majority of the products that were sent for review with exception of the protein cookie. However, despite not liking one product, I am keen to try some others too: I actually have a list written out of what I would like to order. I would definitely recommend it. I have a feeling that my order will be pretty long when I order - so many things and flavours!